Writer and director Noah Baumbach is often compared to Woody Allen, and it’s easy to see why, considering how often his comedies get cynical about adult relationships. But now he’s earning that comparison in the most impressive way yet — he’s tapping into some of his most imaginative work, and his most original writing, heading into his second decade as a director. Baumbach started with 1995’s Kicking and Screaming — a winning blend of humor and hope. Its characters, a bunch of funny but fumbling college graduates, captured a common phenomenon: the post-college slump, during which young adults realize that avenues of freedom, exploration, and possibility can quickly narrow into the routines and pressures that have always seemed so far off in the future. Since then, Baumbach has improved as a director of actors, but his screenwriting record has had both highs and lows. He has given us imaginative whimsy (co-writing both The Life Aquatic with Steve Zissou and The Fantastic Mr. Fox with Wes Anderson), awkward family portraits (The Squid and the Whale), and ugly cynicism (Margot at the Wedding). But something happened after the bitterly bleak Greenberg. And that something was Greta Gerwig. Their collaboration kindled a new spirit of hope and humor, brought out what many (myself included) consider Baumbach’s best: 2013’s Frances Ha. And some could not help but notice that this was a return to the themes of that first and most high-spirited of his films. Less than two years later, he has two more well-received films: While We’re Young and Mistress America — both of which tap into anxieties about finding a rich and meaningful life in college and post-college. Mistress America is the stronger of the two, and it’s now available on a variety of streaming platforms for a larger audience to discover, and here’s hoping that they do. It isn’t as perfectly concentrated and cohesive as Frances Ha; nor is its colorfully flashy style as vital to its ebullience as its predecessor’s black and white (Gerwig seems to flare up in full color when performing in gray-scaled scenes). But it is frequently laugh-out-loud funny, and I suspect that a lot of viewers will find it easier to connect with and care about its characters. After all, most of us know what it’s like to want to be a part of things. College. Parties. Cliques. Communities. The People Who Have Made It. The People Who Know How. But for many of us, if we have to ask how to be a part of it, then we’re probably not ever going to be a part of it — at least, not without a struggle — and we’re definitely not invited. Unless. Unless we find the good graces of a mentor. Maybe you can think of people who have given you those invitations to ways of living in the world that would otherwise have escaped you. Me — my world, growing up, was all about family. We did not engage outside of family much at all, except with a very small circle of people at church — “good Christians,” people who were very like us anyway. And while I’m grateful to have grown up surrounded by so much love and care, that lack of socializing with other kinds of people made me deeply insecure in school. I wanted to be part of my dad’s world: the world of high school teachers and students, all of whom seemed to respect him. It seemed like magic, how he moved through the school with authority and expertise. Among his colleagues, I came to know teachers who inspired me follow in their footsteps. I also wanted to be a writer, and I absorbed how to do that from certain writers who graciously taught me to seek rigorous criticism. But being cool and popular? I responded to my Social Outcast status with a defense mechanism: cynicism and self-righteousness. I avoided “the Popular Crowd.” Later, coerced to join the Student Council, I was required to plan parties and activities, and lo and behold, a couple of upper-classmen decided that my ideas were good enough to earn me some training in “cool.” I’m not sure I learned much from them, and I cringe to think about how much their approval meant to me, but that was the late beginning of my difficult education in becoming a social animal. Why am I writing all of this down? Because that’s my connection point with Tracy (Lola Kirke), the young traveler on a quest for identity and acceptance in Mistress America. I get Tracy’s tenuous point of insecurity and self-preservational cynicism. I feel her pain all the way through. And yet I know that if she finds the necessary codes, she’ll be in for a whole different kind of trouble. Tracy’s search for identity makes sense: Her family unit was supposed to give her a sense of being grounded… but that has failed her. Will she find meaning in a club? In a relationship? Of course, Tracy finds Brooke (Greta Gerwig) in the heart of it, already a part of it — New York, New York: the world of flash, dazzle, and everything all of the time. We first see Brooke awkwardly descending some stairs with the glee of someone who just won the whole city in the lottery, and whose sense of ownership is way ahead of her ability to navigate it. “Tracy!” she cries, throwing her arms wide as if this is a long overdue reunion between best friends instead of a first meeting of an unknown sibling-to-be. Brooke lives her life like it’s improv — she says “Yes, and” to everything. And so does the movie. Mistress America moves with a vitality that makes moviegoers justified in recalling it as a high-spirited musical. Brooke has modes as distinct as Instagram filters. She tends to start out in a sort of Manic Pixie Dreamgirl mode, where everything is exclaimed, unpredictable, and joyful in a way that charms us against our best efforts to resist. (She’s 30 going on 21, spontaneous, and would probably prefer to be called “whimsical” than “flighty.”) The problem is that when you move at the speed she does, you can’t settle into anything, and any attempt at a substantial, lasting relationship gets left in her dust before she even recognizes that the opportunity was there. She wants to belong to everything and ends up belonging to very little… except to the grace of those who accept her boisterous, blustery temperament. As she was born in the ‘70s, it’s a wonder that she wasn’t named something like Zephyr. But the central conflict of the movie will be one of those things that you might have seen coming. In fact, it’s right there in those names: Brooke is a rapid, agile stream of consciousness and Tracy is tracing her path. Brooke is happy to assume she has an apprentice, but what she has is something of a biographer in disguise. Actually it’s worse than that — Tracy isn’t bringing Brooke to life on the page; she’s stealing her life for the sake of a good story. As in the movie Margaret, we get clues from what’s read in a lit course about the nature of our main characters. One student makes this observation about Antigone: She “thinks that she’s above the law, but she’s not. Like… a celebrity in a car crash.” Brooke doesn’t think she’s above the law, necessarily — but she does seem to live on the run, skirting the edges of the truth about herself. And the truth is that she — like Gerwig’s Frances — is frantic to avoid a black hole of self-knowledge, the reality that her impulsiveness and spontaneity have kept her from putting down deep roots in anything that will sustain her. Her peers have found vocations, financial success, relationships, but she is too fidgety to commit. I came to Mistress America fully expecting to finally run out of patience for Greta Gerwig’s Greta Gerwigness, but no — I enjoyed her company once again, and wanted to see her find some love and appreciation. Gerwig is enjoying a run as winningly nutty as Diane Keaton’s early performances, and she’s doing it without depending on romantic chemistry with male leads. Fortunately for moviegoers, Lola Kirke has a quiet strength that keeps her irrepressible co-star from completely stealing the show; I hope this is a breakout big-screen role for her. I see myself in both of them, and I’m sure many moviegoers will as well. In Tracy, I see a worrying mirror of my young-adult self, craving acceptance to the point that I was learning the wrong lessons. In Brooke, I see my own desire to be creative, imaginative, and authentic without selling out for the pursuit of material success. Neither character is likely to ever feel embraced by the success-driven society around them, but the movie asks us to consider if that embrace is worth the cost of integrity and conscience. The movie’s a joy, and maybe the only 2015 comedy for adults that manages to be both smart and hilarious. See it. Or… ask for a second opinion. Like Frances Ha on Adderall, Mistress America finds Baumbach working with a manic screwball energy that has more in common with Preston Sturges or Howard Hawks than it does any of his previous films. … A giddy treatise against the need for outside validation, Mistress America nimbly vivisects how we define ourselves in an age when Twitter allows people to broadcast their achievements so widely that every cell phone doubles as an EKG machine for our self-worth. I think the film can read as a fluffy screwball comedy, and at the Q&A after the film Baumbach said he had in mind the ’30s and ’40s Howard Hawks screwball comedies. … But the other connection interested me more: Baumbach mentioned the genre of film from the ’80s and ’90s that I think of as the more lighthearted heirs to Brideshead Revisited: working-class person gets introduced into bourgeois society, falls in love with the whole aura of it, and then learns some tricky lessons. … Because it’s an heir to Brideshead, I start thinking about the spiritual dilemma at the core of that story — who are you really in love with? and is that love actually for something beyond humans and human things? — and so a little of what Mistress America does is tap into the aching longing everyone has for life to just work, for things to be beautiful and full of love and home. And since it couches it in a very, very funny movie, I’m already looking forward to watching it again. Baumbach’s best film by far, a delightful screwball comedy that analyzes the same artists and hipster intellectuals that Baumbach usually explores, but that does so with an overwhelmingly optimistic energy that erases any of his usual bitterness. 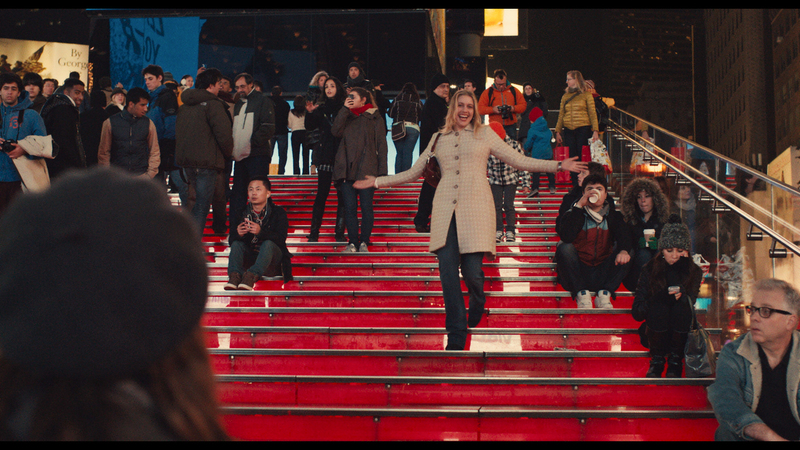 Simply put, Mistress America is a blast. Mistress America is by far Baumbach’s funniest film, anchored by a completely new sort of performance from Gerwig, and blessed with a script so smart and sharp, many of the film’s jokes don’t land for a few seconds because A) you’ve never heard anyone say anything like that and B) it’s just so damn intelligent.